“Sleep no more! Macbeth hath murdered sleep!” is an unforgettable line from one of Shakespeare’s darkest plays, where a seemingly good man and admired soldier eventually murders his way to a throne, his bloodthirsty, unsexed wife at his side. The play is considered cursed by many in the theatre world. In fact, you can’t even say the title within the walls of the theatre, or you may have someone make you exit the space, turn around three times and knock to be given readmittance. Actors have broken limbs, shows have gone down, and luck has befallen those who utter that name. Instead, it’s referred to as “The Scottish Play”. When spoken of at all. This week was all about Shakespeare’s Macbeth for this little Dusty Baker. Sleep No More by Punchdrunk, UK. 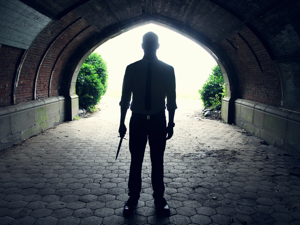 Punchdrunk, a theatre company out of the United Kingdom, has brought New York City an incredible treat with their version of Macbeth, one that contains few words and where you have to go (literally) chasing for a storyline. I can’t give you too much, because what this company offers is a completely different experience for everyone who walks in the doors of the McKittrick hotel they’ve created on 27th street by 10th. Let’s just say this is a piece of physical theatre, a throwback to the “happenings” of the 60s I so crave and admire, and a breathtakingly designed work. The friend who went with me and I had completely different experiences; she was following characters through their journeys of the 3-story, walking exploration. I sat with an actor in an empty room, watching him sew silently, observing the audience walking about and how they did or did not become more bold by their anonymity. For Punchdrunk gives everyone a mask they must wear for the duration of their experience, and insists on silence. They purposely try to break up groups of friends so that you explore on your own. They suggest a cocktail (horribly expensive at the bar) before you go in. I second them on that. For those who are sheepish, you can hold someone’s hand and search the cavernous space together. And if you’re ever overwhelmed, there are black-masked crew members ready to take you to safety. But I recommend doing exactly what Punchdrunk suggests: go in alone, a tad tipsy, and find the story of Macbeth. Touch things. Sit quietly. Seek out dark spaces and be still. Watch beautiful bodies give you glimpses of this horrific story. And then grab drinks with your friends after and marvel at how awesomely different your shows were. Friday night was the polar opposite of Sleep No More. Well, not polar opposite. Both shows utilized incredible performers and were smartly directed. But where Sleep No More contained no text and was all about design and space, Smith Street Stage’s Macbeth was all about the story. And damned good actors performing it with little more than a few daggers and chairs. I love what this company is bringing to Carroll Gardens, a part of Brooklyn that I want to live in every time I visit, with an abundance of delicious-looking restaurants, green stores, boutiques… everything. But until Smith Street Stage came about, the area didn’t have any free theatre in its gorgeous little park. And it still doesn’t have much by ways of children’s art classes or family-friendly theatre events. So I am incredibly energized by the creation of this talented company and their growing presence in the neighborhood. I was blown away by their Macbeth last night. Their performance space is in the middle of the park, this time set in front of a shelterhouse where they could use doors and have somewhat of a backdrop. There’s a noisy playground to one side, neighborhood kids come and go around the space, and now and then a large truck rattles down Smith Street. But these actors know how to work the space, and with minimal effort you get every word. Which is the most important thing about getting to enjoy this piece. The play contains some of the most beautiful lines the bard ever wrote. And with some actors playing double parts and a script that’s heavy with military talk and royal titles, if you miss something you’re off for a while. Which is where my praise for this cast comes in. From Ben Horner’s Macbeth to Sam Rosenberg’s Banquo to the weird sister trio of Beth Ann Leone, Leal Vona and Patrick Harvey… I truly admire all of them. I was especially moved by Mary Cavett’s “will this little hand e’er be clean” (paraphrasing) madwoman scene as Lady M. and Gordon Tashjian’s Macduff, who literally made my heart shake when he learns that his wife and children have been murdered. It was a particularly incredible scene, very well directed (awesome in general, Jonathan Hopkins), treated with such gentleness and genuine respect despite the chaotic scene offstage in the park. I’m not a fan of theatre in parks with craziness surroundings. I produced a version of the Oresteia in Central Park a few years ago, and while I loved my cast I’ll never do it again. And as much as I love Shakespeare, I know many of the plays so well that it’s hard for me to be moved. So bravo, Smith Street Stage actors and directors. Ruark Downey – excellent music again that shaped the piece and pulled it together. Jessica Weiss – way to make fight choreography in the park fly. Oh, so why was I watching Shakespeare in a park when I’m generally not a fan of ANY theatre in a park? 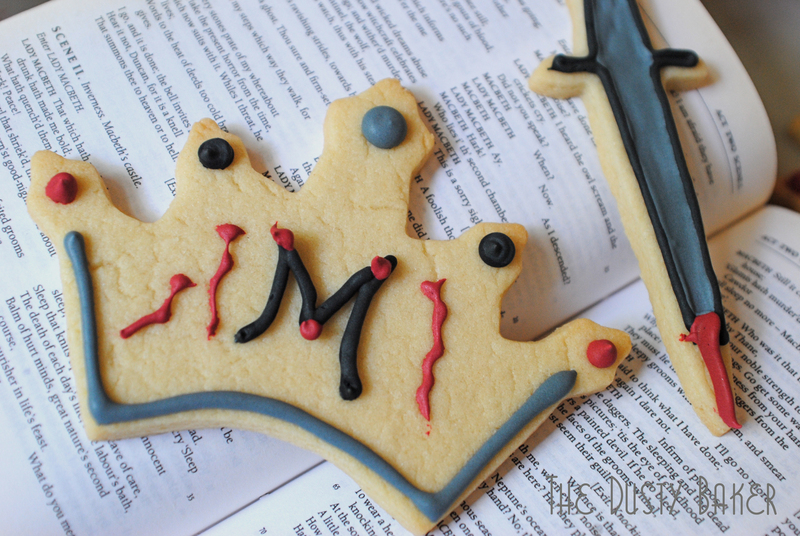 Because (a) I love this company and (b) I had to bring them Macbeth cookies! 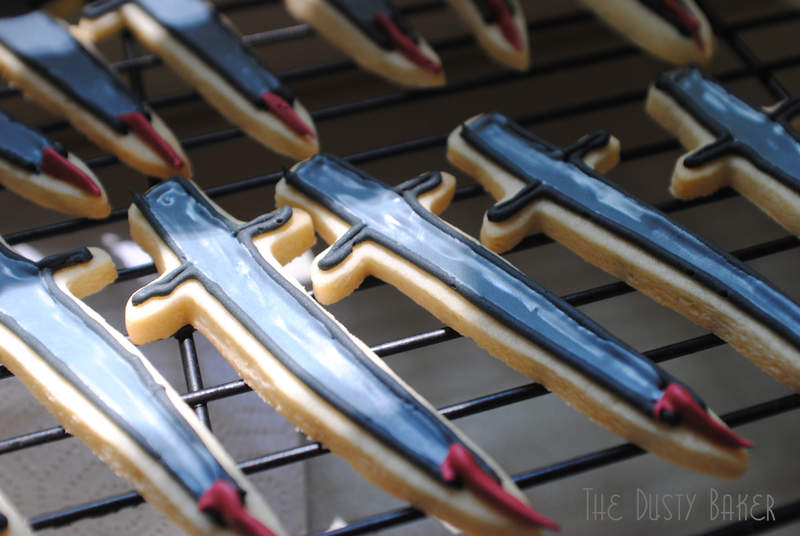 This is the same company that I recently did a benefit for, a concert version of Jesus Christ Superstar, for which I made Cookies for Jesus Christ Superstar. So we chatted about what I could make for this show and voila! 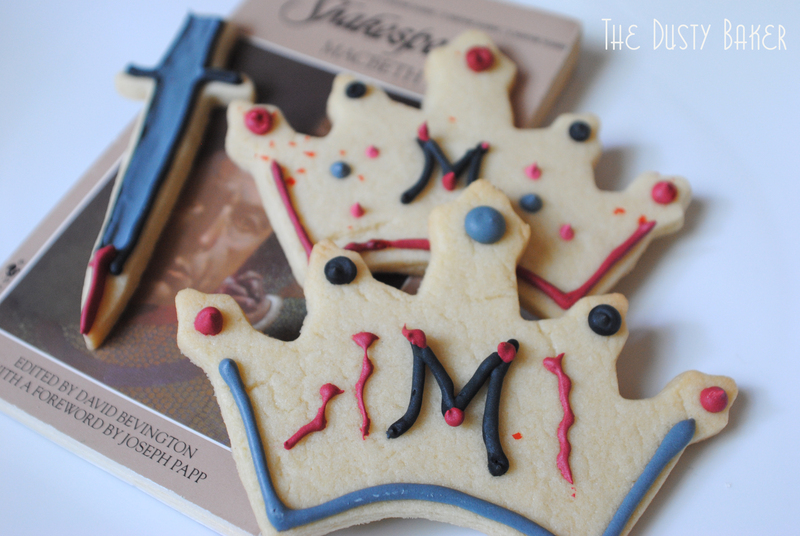 This recipe is not my own – I simply made Saveur’s Classic Sugar Cookie Recipe and a basic royal icing. It took a long time. I definitely don’t charge enough to make up for the ingredients and time I put into them. But I LOVE making them, and love this company. So there you have it. Now go see some Shakespeare!